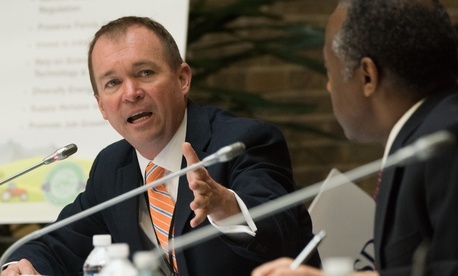 Mick Mulvaney, the acting director of the Consumer Financial Protection Bureau (when he’s not occupied with his other job, running the Office of Management and Budget), has a bone to pick about the name of the agency he’s heading up on an interim basis. "I don't know why we call it the CFPB,” he told a House panel earlier this month. “That is not the name of the organization. The organization is the Bureau of Consumer Financial Protection." But that bureau, since its creation in 2010, has not been known as the BCFP, but rather as CFPB—possibly to emphasize its consumer protection mission rather than its bureaucratic status. The name is all over the agency’s website and reflected in its logo on official documents. But that’s changing: In March, the bureau unveiled a new seal incorporating the official name. The shift incorporates traditional federal imagery (unlike the CFPB logo) and “aligns the bureau with the seals of other federal financial regulators,” agency officials said at the time. Why all the fuss over a bureaucratic moniker? After all, Mulvaney himself has long referred to the agency as the CFPB. But he says he’s committed to changing his ways. “I’m trying to get in the habit of now saying the ‘B.C.F.P.’ It’s really, really hard to do that when you’ve said the C.F.P.B. for so long,” he told a group of banking executives Tuesday. And CFPB has a fairly strong brand. That may the reason for the shift. The New York Times reported that the new name policy was all part of an effort to “diminish the agency’s public profile.” Political appointees at the bureau have gone so far as to ask the Associated Press to change its style on the agency’s name to BCFP. AP’s standards are followed by many news organizations.